Home Inspiration where do you get yours from? I am not the best at putting a look together and so need inspiration to get it right. I often to turn TV programmes and spot things I like and then search them out. This week I have been glossing at home and it is one of those jobs that once started I never know where to finish. With spring coming I have decided to do the ultimate spring clean by freshening up all the doors, rails and skirting boards. So far I have done the upstairs bathroom and now the downstairs loo. However yesterday as I was doing the glossing, I started inside the room before attempting the outside frame but then didn’t know where to stop! I kept thinking I’ll do this bit and stop! I feel now that it is going to be a never ending task, but it is amazing the difference it makes. However I have digressed! Home inspiration is comes in all forms from soaps and reality programmes like Big Brother. My children have pointed out in the past when we had the same dresser as a rather famous EastEnders family! Big Brother this year has been rather explosive with the ultimate relationship betrayals, controversy and celebrities refusing to do tasks yet I was marvelling at the furniture! I was often peering around the characters to see the finer details of the house! It would be a great place to have my 40th birthday party! If you want to get your own piece of Big Brother furniture or accessories many of the pieces are available to buy and would be talking points when friends are round! 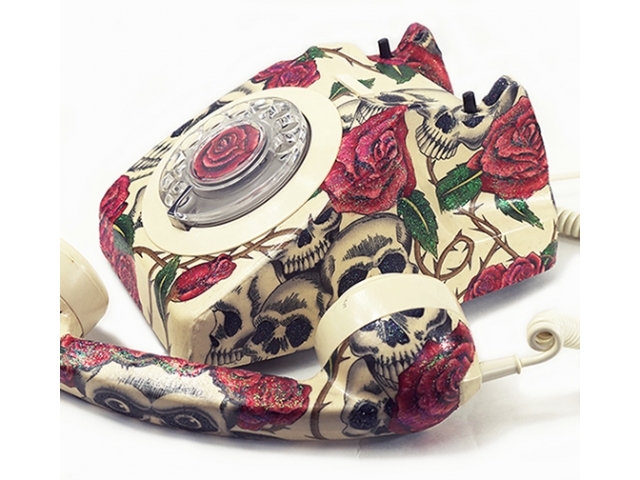 Love Kitty Pink have some great vintage decorated phones including the one that was in the house. The chairs are available from Distinctive Chesterfields and certainly add a touch of glamour to anyone’s home. Some of the soft furnishings came from Faux throw which I would love to throw on my sofa. Every evening the teen and I snuggle under a heated blanket on the sofa. It is our place to watch the TV that we enjoy watching guilt free after doing all our chores! Very also have a shop the Big Brother section on their site for more of the house pieces. It enables fans of the programme to borrow the inspiration the designers cleverly put together. Remember that house, like many other TV shows, have been put together by some of the best designers out there. Therefore using their inspiration is another great way to put a look together.